Following on from our Jewish theme last week I thought it would be nice to share a Jewish wedding that took place in Spain last Summer. Our bride and groom Gemma and Bradley, who live in London, were set on having their wedding in Spain. They wanted to show their friends and family that they could still have all the traditions of a Jewish Wedding and affair even though it was taking place abroad outside in the warm Spanish Mediterranean climate. Sunshine Weddings Spain introduced Gemma and Bradley to a Rabbi who was willing to fly to Spain so they could hold their Jewish wedding ceremony. They discussed how they could still have the bedecking ceremony and chuppa set up outside in the grounds of their wedding villa venue in Mijas. The whole concept of having the wedding in Spain just added something special to the entire celebrations and they knew they would give their wedding guests something to talk about for a long time after the wedding day itself had taken place. The anticipation began to build as friends and family started to book their flights and to plan their long week-end break to Spain based around the wedding invite which was not only one day but a week-end long of celebrating. Bradley and Gemma had organized a beach party for the day after the wedding as an extra special thanks to their guests for flying over to spend their wedding day in Spain with them. Bradley began his celebrations by having his stag in southern Spain, which gave his male friends a taster for what was to come, fun and partying in the sun! The day arrived and everyone was in high spirits all the men met beforehand to toast the groom and then danced him to where his bride sat waiting to the sounds of violin for the bedecking ceremony. Gemma was surrounded by her family waiting to meet her groom so he could place the veil over her face ready for the Chuppa ceremony. Spirits were high and the moment was magical set in the grounds of this beautiful private wedding villa in Mijas. 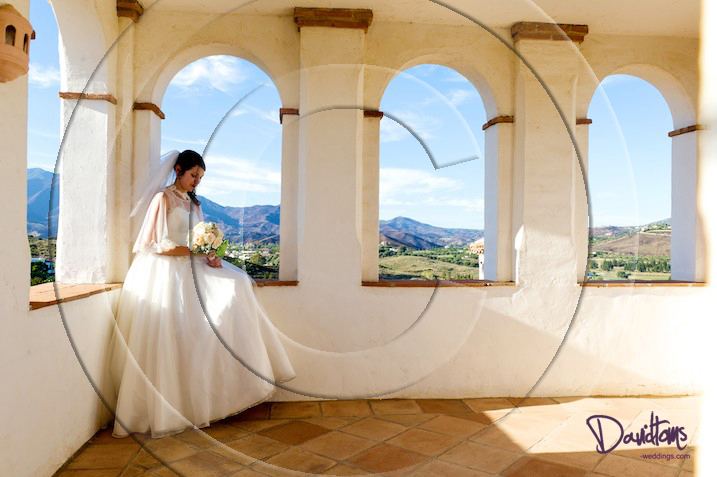 All attention was on the bride as she circled her groom, as part of the Jewish wedding ceremony traditions; the Spanish countryside setting the background scene creating a breathtaking and emotional wedding moment. Once the rings had been exchanged and the breaking of the glass had taken place to seal their marriage the Israeli Jewish dancing began and what fun the guests had enjoying their wedding celebrations outside in the sun. As the night air cooled to a pleasant temperature they took their seats and tucked into a traditional Spanish meal of paella with the option of fish or vegetarian to keep in line with the Jewish catering traditions instead of having kosher food. From the look of love and contentment on our Jewish bride and grooms faces their wedding in Spain really had been a success and in true traditional Jewish style.